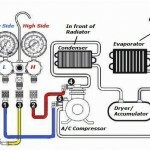 © DenLorsTools.com Summary: Tips and basic instructions from an ASE master auto technician on how to hook up AC gauges to a car’s 134A air conditioning system. systems, were usually converted to the more accessible and less expensive 134A anytime a system had to be repaired and it was more feasible. The 134A systems are easy to spot because of the much different service port connectors. 134A uses a larger, non-threaded connector. It’s called a quick connect. The low and high side service ports on cars are somewhat fool-proof because of the different size connectors. The low side is smaller than the high side making it impossible to hook them up incorrectly. Color coding on the AC Manifold Gauge Set hoses also makes identifying them easier. Blue is low, red is high and yellow is for the vacuum pump or refrigerant source. The refrigerant source for DIYers is usually a can tap that hooks to a 12 ounce 134a can. The source for a shop is typically a 30 pound refrigerant tank. 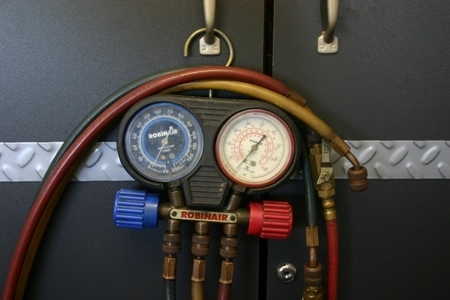 Shops use a refrigerant scale to measure the amount of refrigerant dispensed, while the DIYer keeps track of the amount of freon put in by the adding up the individual cans used. The best method for shops by far is using an AC machine which has everything needed built into ONE piece of equipment. The AC machine has gauges, hoses, fittings, a vacuum pump, scale and recycles old 134A so it can be re-installed. 2. Make sure both valves on the manifold gauge set are closed (all the way to right). 3. Connect blue adapter to low side service port (5). 5. Start engine. Turn AC mode selector to HIGH (MAX or Recirculate) and fan speed to HIGH. 1. 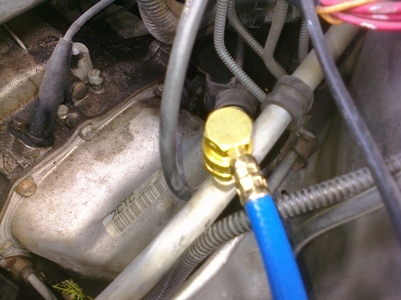 Verify that both valves on the manifold are shut completely. 2. 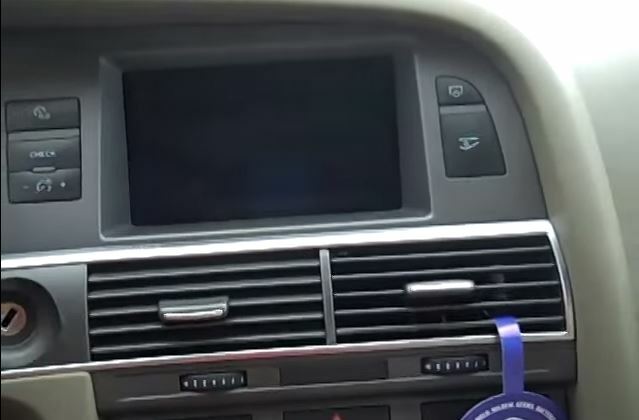 Start the car and turn on car and AC system. 3. Connect the source end of the yellow hose (3) to Refrigerant can tap (or tank). 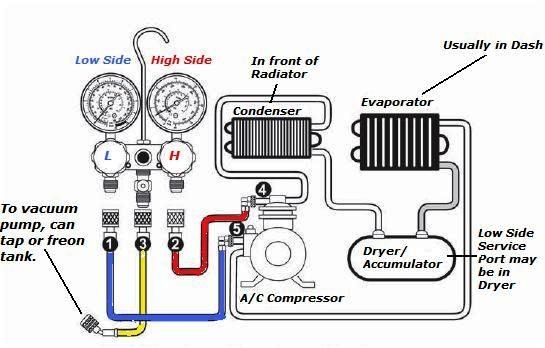 Follow refrigerant manufacturer’s instructions for proper dispensing and precautions. NEVER charge through High Side. 4. Open the AC gauge manifold LOW side (blue) valve slowly to dispense. Do not exceed 40 psi during the recharging process. Allowing pressure to go above 40 psi could damage the compressor. 5. When charging is finished, close low side (blue) valve. 1. Attach gauge set to the car’s AC system. 2. Verify that there’s no refrigerant in the AC system. 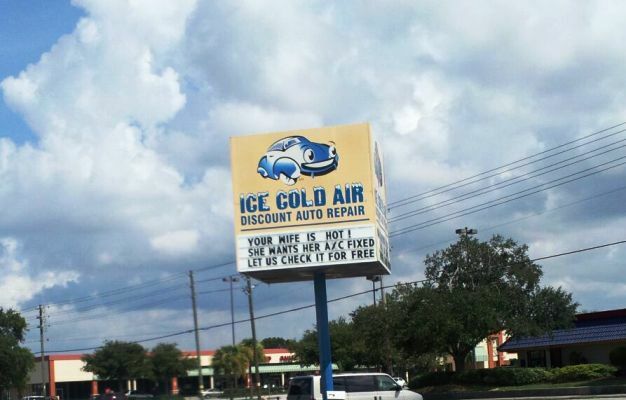 Note it’s illegal to release refrigerant into the atmosphere. 4. Open both AC manifold gauge valves. 5. After system has been evacuated a gauge reading 0f 29″ Hg (inches of vacuum) should be reached, run the vacuum pump for 20 minutes. 6. Close both AC manifold gauge valves. 7. 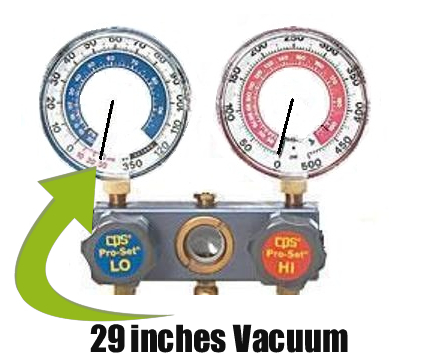 Wait for at least two minutes and verify that vacuum reading stays at 29″ Hg. If it does NOT then it’s likely there’s a leak. Thanks, very informative site. How much do ya get for a vacuum pump?? We have a wide range. Click the image below to see the vacuum pumps for sale right now.